Heaviest Fish in a competition - Chris Hansell - 12 lb 04 oz. 1st - S Howard - 18 lb 03 oz. 2nd - James Kelly - 13 lb 11 oz. Whitby Sea Anglers Association held their annual dinner at the Giardini Restaurant Roxby. There was an attendance of 59. Mr Ron Wood, Chairman welcoming those present, said it had been one of the worst seasons he could remember, although he had been pleased to see more younger members catching more fish. Mr Tony Barningham, secretary, said 30 members had fished. 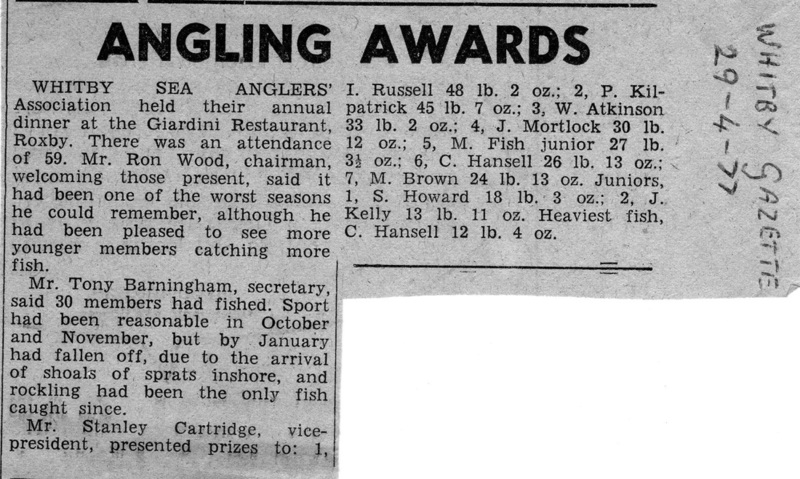 Sport had been reasonable in October and November, but by January had fallen off, due to the arrival of shoals of sprats inshore, and rockling had been the only fish caught since. Mr Stanley Cartridge vice-president presented prizes. October - 3 lb 04 oz. November - 8 lb 03 oz. December - 8 lb 08 oz. January - 13 lb 03 oz. February - 0 lb 00 oz. March - 0 lb 00 oz. Total weigh-in 33 lb 02 oz.